Just before boarding the bus to the start line, Sunday morning. 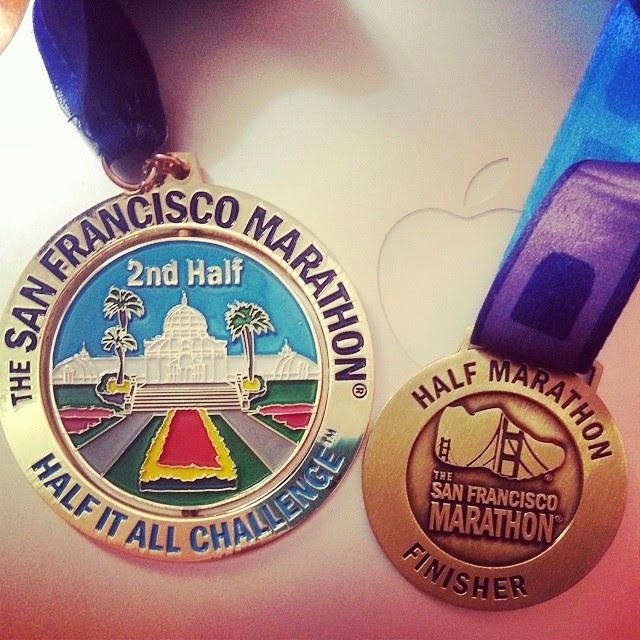 On Sunday morning, I ran the second half of the San Francisco Marathon. 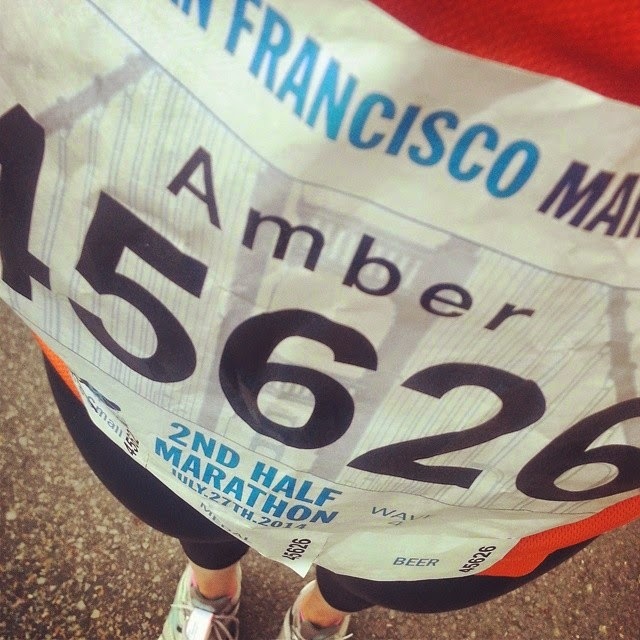 Before I continue, I really must link to the post I wrote after running the first half of the SF Marathon last year. It's right here, and I love looking back on it now. Last year, after finishing with a time of 2:51, I said: "I have unfinished business. I want to do it again." One of the most fascinating things about running a half marathon (or any long distance larger than that) is this: no matter how much you physically train for an event like this, spend months getting your body and your mind and your emotions ready for it -- there's really, actually, truly no way to fully prepare for the physical, mental and emotional experience of race day. And that's one of the coolest, most humbling, most triumphant things about distance running. Another thing that goes along with my previous point. Because of this unpredictability, and the fact (really, it IS fact) that any half marathon is an accomplishment -- every half marathon is a tremendous accomplishment. The feat does not lessen with subsequent half marathons! Isn't that awesome? I thought it was. Because this time was even more special than the last. I learned so many lessons running my first half marathon. For one, I learned what it was actually like to run a half marathon -- crucial information that can help you later. This year, I felt I trained a lot better. I have many friends I can thank for encouraging and inspiring me along this path, but two of my best friends in the entire world, Meghan and Stefanie in particular deserve special mention, for always being there for advice and encouragement -- whether it be about running, or meal plans, tapering or just a friendly voice. Anyway. Lessons. This year, I definitely took a different approach. I am a much smarter under than I was at this time last year. I trained smarter, I am in better shape, and mentally, I'm just a much better runner than I've ever been. With experience comes wisdom. I don't claim to be a wise owl or anything (as I was crossing the finish line last Sunday I thought "I could never run a full marathon.") Those may be famous last words (I kind of hope they are) but as of this moment, I have no idea how a person could actually finish a full marathon. So I have much to learn. Not claiming otherwise, at all. This year, I ran an easier half marathon. 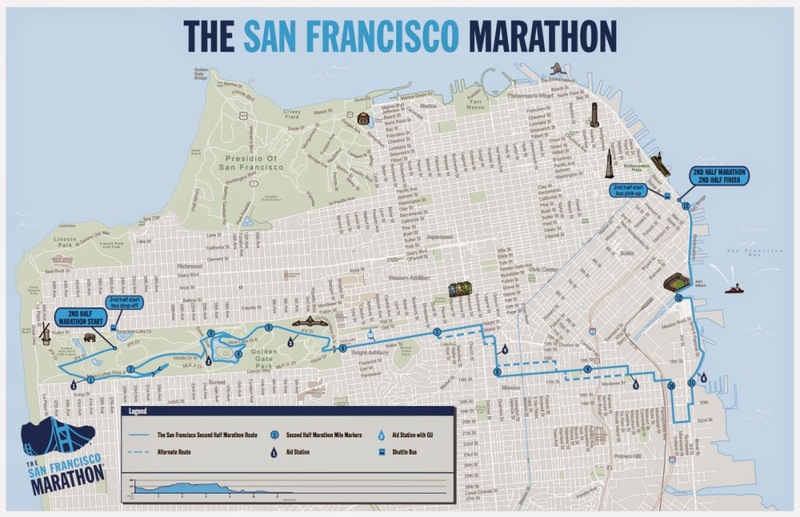 It was still incredibly challenging, but it's definitely the easier half of the SF Marathon to run. There's no Golden Gate Bridge, so basically, yeah. I trained much better, and actually a) tapered, and b) carb loaded the week of the race. I went out for a massive spaghetti dinner the night beforehand. I didn't have to get up so early for this race, so I was able to eat a bit better, though still not as much as I wish I could have. I am just not good at eating right when I get up. I did get to have some coffee, though, as well as water, and that helped. I didn't stop running. At all. Ever. Not even when there was a hill. Even when I was crawling along, I didn't stop running. Even when I thought my legs were going to fall off. Ever. I tried to run along with a Pacing Group (2:30). I lost them after about 6 miles (I was ahead of them) but I think it was a really good decision and a great motivator. Speaking of motivators. 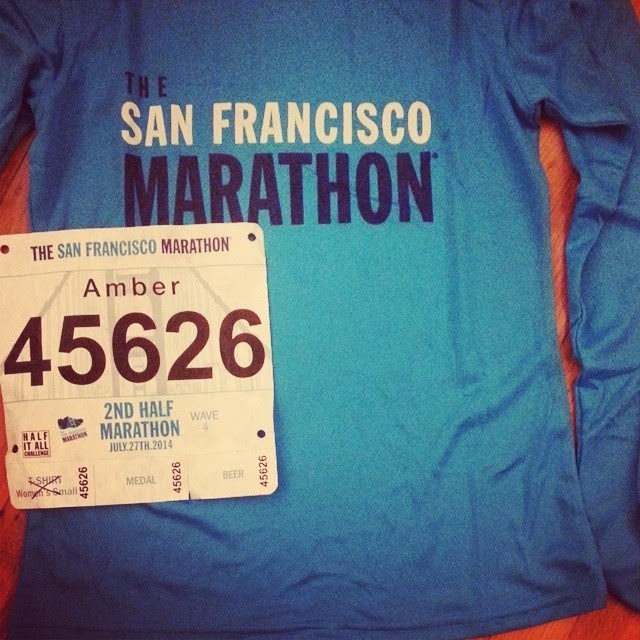 This year I was fortunate enough to be an SF Marathon Ambassador, an experience which has changed my life. I've been introduced to a community of fellow runners, of all shapes and sizes and experience, and together we helped each other along the way. I will never forget this experience. I was made to feel special, and empowered, and I really think I helped some other people this year. It was an amazing experience and I hope to be lucky enough to do it again. Anyway, I ramble on, and such, as usual. Let me go through my mile recap. That's always fun. Miles 1-6: These were the Golden Gate Park miles. I actually began the race thinking I'd be running an 11:22/mile pace the entire time, as I had sandwiched myself between the 2:30 pacers before the race began. But immediately, one of the pacers started going faster, and I found myself pacing along with her. My running app was malfunctioning, but not too badly (this is the story of my year, so I was just thrilled to get away with a small malfunction). There were a lot of hills, but also downhills, and turnaround areas in Golden Gate Park, but I knew we'd be out of it after about six miles, so I coasted through this section. I had some Gu in my pants pocket, and ate it during this section. I really, really loved the cloudy, cool weather during this segment. I remember a period of time around mile 4 where I felt I could conquer the entire world during this race. I spent the rest of the race remembering that moment and trying to recapture it. It was magical. Miles 7-8: I kept up the pace. I had lost my pacing group and thought I was reaching milestones about 2 minutes ahead of where I should be to finish with my goal time of 2:30. I had the times on a wristband. Now I was on city streets, and the weather had not only cleared up, it became pretty hot. I was uncomfortable, but tried to keep myself relaxed, breathing deeply. I was really excited at mile 7 when the Gu representatives showed up. I took one more strawberry banana Gu gel, along with a package of the Gu gummy chews. I remembered what I'd been told, and tried not to take ten of them at once or anything, but I was consuming Gu at a pretty fast clip after this point. I would sort of regret this later, but honestly, not really. It helped me a lot at the time. Mile 9: I think there's a moment in every long race where "the struggle" begins, as my fellow Ambassador Charles said in his blog recap. This is where "the struggle" began for me. I was noticeably losing steam. I realized I'd trained up to 11 miles before this race, but nothing had prepared me for how hard I would run on race day. Or the literal + figurative ups & downs of actually being in the thick of it, again. I was handling it, but I think I was slowing down at this point, and mentally, I really, really wanted the race to be over. Thinking that I had 4 more miles wasn't really helping, and I started popping those Gu gummy chews faster than before. Uh oh. Ha. Mile 10: My legs started to hurt really badly during this time. I noticed that my head was actually really clear, and my lungs felt really good -- but below the waist, I was really tensing up. I kept trying to hold to my "no walking" rule, and tried to lightly stretch my calves as I ran. I didn't want to get "peg leg" as I had in so many other races as a more novice runner. I started telling myself I could finish with my goal time, or even better, as every time I looked behind me, I still couldn't see my pacing group. This was while we were running through the Dogpatch. Lots of brunches with little kids were going on at the Dogpatch area cafes, which was pretty amusing and surreal to see. Mile 11: One thing I hope to always remember. I was grimacing at this point as my legs continued to slowly fail me. But just as we turned the corner onto Terry Francois Street in Mission Bay, a DJ started loudly blasting "Eye of the Tiger" -- one of my power songs! Even though I was fairly certain my legs were going to fall off before I finished, I smiled, and felt rejuvenated with new energy. New magic. It was between miles 11-12 when I began thinking about how Gabe would be waiting for me at the finish line. I'd never had someone waiting for me before, and it was a huge motivator and really kept me going. Miles 12-13: I was actively looking for Gabe at the sidelines during this time, trying to think about anything but running, anything but the finish line, which I still couldn't see, anything but how my legs literally felt like they were going to come off, or at least my calves. I was fairly sure my legs no longer bent at the knee with each step. I kept thinking about how yeah, it hurt a lot, but it would stop hurting after I finished. I also kept thinking about how much I didn't want Gabe to see me walking to the finish line, so that alone is what kept me going: pride. Mile 13.1: As I crossed the finish line with a huge smile (I did it!) I knew Gabe was out there, and finishing a race never felt so good. It was an amazing moment. Also amazing was my time: 2:28:18. Not only had I finished ahead of my goal time of 2:30, but I had finished 20+ minutes faster than last year. All of my confidence had been well placed. I had done it! If I'm going to be completely honest, the rest of the day was a large amount of pain and discomfort, plus having trouble eating, plus eating a lot and then relapsing with all the pain, but who cares, it was so worth it. I call that the "post-race 'I'm going to die now' phase" so it's not like I knew I wouldn't be burdened with horrible nausea for the rest of the day (several of my long runs were also like this, so at least my training gave me an idea of what to expect?). Sea Bands proved very helpful with that nausea, by the way -- hooray for Sea Bands! Several hours later I was already plotting my return to half marathon life (what? ), and today I registered for the Berkeley Half Marathon in November. Selective amnesia? Sure, I'll take it. I am really proud of myself for everything I've accomplished here. I am looking forward to not pushing it quite so hard next time, after setting such a great PR this time. I'm doing it strictly for fun. It's now two days post-race and most of my soreness seems to have abated. I'm going back to yoga today, and hope to be back running in a few days. Thank you to everyone reading this -- you have contributed in some way to my success here, and I am so grateful. YOU ARE AMAZING. Thank you for pushing me to keep being a runner. And for being my spaghetti mule.